A charming B&B, celebrating theatre and wine – both key to the Niagara area! Come and visit for a while! Finlay House is located in the historic Old Town, a few minutes stroll to picturesque Queen Street and the Shaw Festival Theatres in Niagara on the Lake, voted the prettiest town in Canada. Our rooms are bright and comfortable and come equipped with all the ‘mod cons’, including: A/C, central heating, free wireless internet access, flat screen LCD televisions, mini fridge, wine glasses, hair dryer etc.. Our B&B furniture is handmade by the Mennonites from St Jacobs and is quite lovely. We provide a comfortable guest lounge with a fireplace and a private B&B entrance. We have a lovely outdoor porch sitting area where you can watch the world go by with a glass of Niagara VQA wine. 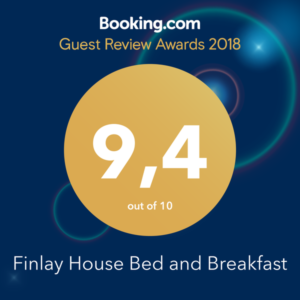 Finlay House is a smoke free bed and breakfast. We have free on site parking. Breakfast is a generous and delicious meal, served in our friendly dining/living room. We serve a traditional breakfast consisting of scrambled or over easy eggs with Canadian smoked bacon and local whole wheat or white bread. Also included in our menu is a choice of Granola fresh fruit yogurt parfaits, fresh fruit cups, and a toasty croissant with eggs, bacon and Canadian cheddar cheese. There are vegetarian and vegan options also available. Please indicate any special dietary needs before arrival. Guests have separate dining tables to allow for intimate conversations and are equally positioned to also allow for conversation with fellow guests.